As a parent, it’s natural to want to try and protect your children. From the second they’re born, you feel an overwhelming need to keep them safe and protected. However, sometimes the fear over what could happen to our little ones can cause us to become overprotective; particularly during the toddler stage. Your baby is growing up and once they reach the toddler stage it presents a whole new world of potential dangers. It can be utterly terrifying, so naturally you want to step in and help wherever you can. The trouble is, if you try to help too much, it could actually prove to be more damaging to your toddler. Helicopter parenting can cause our children to grow up to become incapable of being independent. They struggle to think for themselves and they’ll also find it difficult to cope with life’s problems later down the line. It can cause significant development issues that will be difficult to address and resolve later on in life. So, how do you know if you’re a helicopter parent and how can you avoid or stop being one? What Is An Helicopter Parent? While helicopter parent is a common term, many are unsure what it actually means. 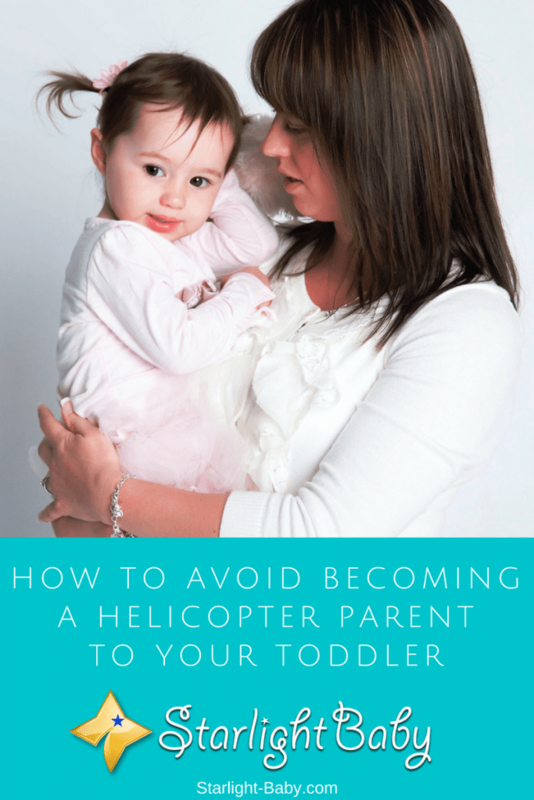 A basic description of a helicopter parent is someone who constantly hovers over their child. They monitor them excessively and jump in whenever they see a potential problem, even very minor ones. You Follow Your Toddler Closely, Waiting To Catch Their Fall – No parent wants to see their toddler fall over. However, there’s a difference between stopping your little one from having a serious accident and stopping them from being a toddler. Toddlers fall, and they fall quite frequently. They’re at a stage where they are learning more about the world around them and they’re still a little unsteady on their feet. Add to that the fact they tend to “charge” into situations and you can easily see why falls are a common occurrence. It may be difficult to hold back when you see your little one stumbling ready to fall. However, minor falls teach your toddler not to charge into situations too much and to be a little more careful. You Never Let Them Play Unsupervised – Now, obviously there are times when your toddler should be supervised. You wouldn’t leave them with a pet dog on their own for example. However, if you find yourself constantly monitoring your toddler and you’re paranoid about letting them play alone in case something bad happens, that’s a sure sign you’re an helicopter parent. Think back to when you were a child. Did your parents monitor you 24 hours a day, or were you allowed to play in the back yard without supervision? Chances are it was the latter. Over time, parents have become a lot warier about letting their children play alone. However, as long as you know your back yard is safe, there’s no need to watch your toddler constantly. You Jump In To Solve Their Problems – If you find yourself constantly getting involved and jumping in to solve your toddlers problems, that’s another sign you’re an helicopter parents. It can include telling them the answers to things before giving them a chance to work it out themselves. Or, you may find yourself ringing up their preschool teachers for continuous progress reports. These are the three main signs of a helicopter parent. It’s important to be honest with yourself. You know yourself whether you may be a little over-the-top with your parenting. So, what if you find you are a helicopter parent? Don’t beat yourself up if you’ve discovered you are a helicopter parent. No parent knows exactly what they’re doing the first time around. It’s scary, confusing and daunting being in charge of a toddler. You’re programmed to see the potential dangers in everything around them. However, while it may be normal to lean towards helicopter style parenting, it can have negative consequences on your little one’s development. The first step to quitting being a helicopter parent is to look at all of the things you currently do for your toddler that they could be doing for themselves. For example, do you find yourself carrying your toddler everywhere despite the fact they can now walk unaided? Or, maybe they know how to get dressed or undressed, yet you take over and do it for them anyway? Realizing what your toddler can and cannot do will help you to see where you should be taking a step back. Sure, you want your little one to develop normally and it can be worrying if you see them struggling with puzzles for example. However, just because they struggle the first time around, it doesn’t mean they have a developmental problem. By jumping in and trying to help by doing the puzzles for them, not only are you damaging their ability to think for themselves, but it’s also going to affect their confidence in their ability to work things out the next time around. So, allow your toddler to get things wrong and avoid the temptation to jump in and do their puzzles for them. This is going to be the hardest tip to follow. It’s difficult as a first-time parent to know the difference between little risks and more severe ones. Everything can seem like a major risk when it comes to your toddler. However, something simple such as allowing your toddler to play in the back yard unsupervised is a risk you can let them take without serious consequences. If they topple over while you’re not there due to running around, they’ll learn to be a little more cautious next time. Toddlers learn through experience so as long as there are no serious risks to what they want to do, it’s important to let them take risks to aid in their development. If you can feel yourself desperate to jump in and hover over your toddler, it’s helpful to leave the room. You can also allow yourself to give your toddler one piece of advice or maybe a demonstration on how to do things just once. Then, if after that you feel like you want to show them again or step in and take over, leave the room. This is a very simple, yet also a very effective technique. Overall, it’s not easy to stop being a helicopter parent. The key is to accept that you cannot wrap your toddler up in cotton wool. Worry and anxiety is part of being a parent and it never truly goes away no matter how old your children are. Putting a stop to your helicopter parent tendencies will ensure you don’t unintentionally affect their development. It’s also important to realize you aren’t going to be able to change overnight. It’s going to take time and persistence to learn how to relax and let your toddler be a little more independent. I am a new parent. I have heard the term helicopter parent, however, I did not know what exactly the term referred. Thanks for explaining. I will never be a helicopter parent. When I was a kid, I always felt restricted when parents were always around me. I did not like them watching me when I was doing homework, project work, or even playing. I did, of course, liked to show my skills and works to my parents, but I did not like them near me when I was working on it. Since I did not like my helicopter parents, I will never become a helicopter parent. Don’t we, adults, just hate it when people closely watch what we’re doing? Same goes for kids – it annoys them when we watch them like a hawk and meddle with everything they do. So let’s not do it, haha. Sometimes, it’s just a natural parental instincts that makes most parent become a helicopter mother or father. That innate need to care for one’s child is what causes this and sometimes, most people cannot help which ends up making it hard for such kids to be independent on their with ease. True, it’s parental instinct to care for our kids. I would say most parents could become overprotective at times. I, too, am guilty of this sometimes. As you said, it could be difficult for kids to learn to become independent when we are helicopter parents so we should know when to refrain from doing such. Let’s give our kids some space so they will learn to be independent and to decide for themselves.